When it comes to picking favorite wines I think it’s wise to be careful. There are so many great wines available these days sometimes it’s difficult to pick one over another. And even if a wine is your favorite, you don’t want to drink it every day. But when it comes to dessert wine, there is no question my favorite is Port, a wine that has been popular for more than two centuries. Port lovers are fortunate because there are so many different styles being released today you could spend weeks trying them all. Port is produced in a hierarchy, with rankings that range from ruby to vintage character to LBV and finally to fine vintage and aged tawnies. The wine must be a fortified wine from Portugal to be a real Port, but there are many imitation Ports made all over the world. Many churches even use imitation Port for their Communion wine. Port is one of those things most of us used to associate with old men smoking cigars sitting around after dinner. But it is becoming increasingly popular with younger folks and women, especially as the less expensive styles are becoming more widely available. Some people mix them into cocktails, and those are enjoyable. But no matter the type of Port, I still enjoy sipping it after dinner, either with a dessert or all by itself. Sales of premium Tawny Ports have been rising for many years, because they are so tasty and relatively affordable compared to fine vintage Port. 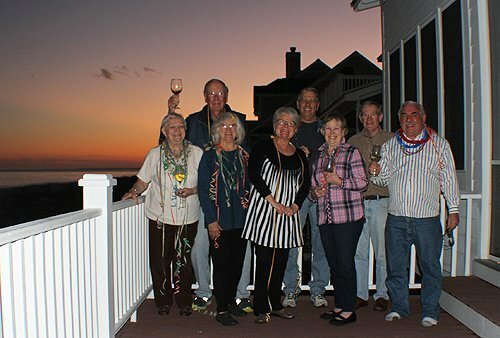 The Magnificent 8 were at Edisto during part of Mardi Gras. This was sunset on Fat Tuesday. 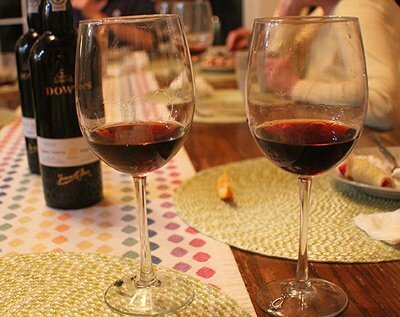 Dow’s 10 Year Tawny and 20 Year Tawny are both outstanding wines. The 10 Year ($36-38) is more fruit forward, lively and fresher than the 20 Year ($64-68). It is soft and rich on the palate with a fine and mellow fruit flavor blending with almond overtones. The 20 Year has more tastes of dried fruit and nuts with some spice, and has more body. The color changes from a deep red for the younger wine to one with more brown tints. Both have powerful, inviting aromas. They are somewhat sweet wines, but I would describe their finish as dry. For many, 20 years is considered the perfect age for tawny Ports. The Symington family, which owns Dow’s, holds one of the largest and most valuable stocks of Port aging in seasoned oak, including barrels that date back to the 19th century. Master winemaker Charles Symington has relaunched their aged tawnies by artfully blending these beautifully mature wines to redefine Dow’s aged tawnies. He also produces 30 Year Tawny ($140) and 40 Year Tawny ($210), but those wines are for the true Port fanatics and special occasions. 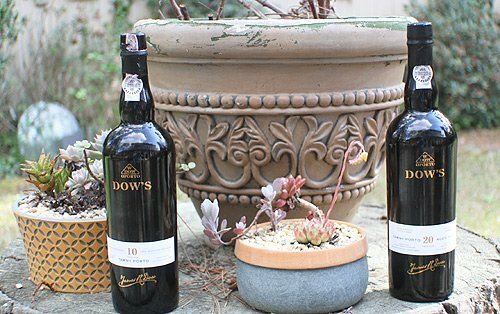 Focusing on the connection between the vintage and aged tawny variants, Dow’s tawny Ports are now bottled in the same classic, elegant, and contemporary black glass as Dow’s vintages. The new labels highlight the provenance of the grapes. Because these fortified wines are 20 percent alcohol, you can put the cork back in the bottle and keep them for several weeks. In warm weather you might want to chill them slightly before serving. 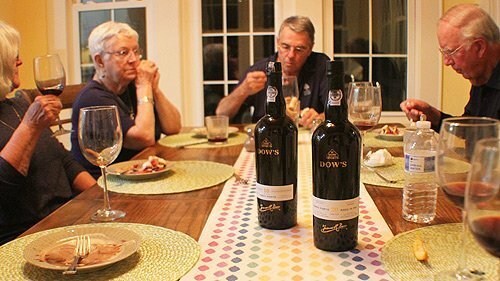 Winery: Dow’s is part of the large stable of top-notch Port houses owned by the Symington family which controls 2,400 acres of vineyards on 26 estates in the Duoro region. Andrew James Symington, a Scotsman, got into the Port business in 1882, but Dow’s began nearly a century before that. Most Port houses were founded by English entrepreneurs, but Dow’s began in 1798 when Bruno da Silva, a Portuguese merchant from Oporto, opened a shop in London and imported wine from his native country. When the Napoleonic wars threatened his business he applied for permission to equip his merchant ships with guns to allow them to travel safely from Oporto to England. As other companies’ sales dropped, Dow’s soared. Other family members kept the company going through the years. George Acheson Warre, whose family had been involved in the Port trade since its earliest years, joined the company as a partner in 1868. In 1877, Silva & Cosens merged with Dow & Co., whose senior partner was James Ramsay Dow. In 1912, Andrew James Symington became a partner, and today six members of the family own and work in the company. The family personally manages all aspects of winemaking from vineyard to the final bottling of the wine. The Symington family became the sole owner of Dow’s in 1961. In addition to Dow’s the company produces Port under these labels: Graham’s, Warre’s, Cockburn’s Smith Woodhouse, Quinta do Vesuvio, Gould Campbell, Quarles Harris and Martine. Goes with: We had these delicious Ports with fruit-filled crepes during a recent visit to Edisto Beach, S.C. with a group of friends. We immodestly call ourselves the Magnificent Eight. Many of our adventures center on wine, including trips to Napa Valley and Willamette Valley in Oregon. For the week at Edisto this year we cooked and ate in our rented house every night, with various shrimp dishes and fish being the entree of choice. Sometimes two of our members, John B. and John D., bake pies for dessert. But this night I made crepes. Another night I made beignets, but that’s for another column. To me crepes are the perfect dessert. After a full meal you want something that’s not too heavy, but does have a lot of flavor. I like sweet desserts, but not too sweet. Our crepes ala Edisto were perfect. Sandy, Edith, JD and JB were enjoying their crepes while sipping the port. John B. took orders and then he and I filled each crepe with a choice of pineapple, strawberries, tangerines and bananas. 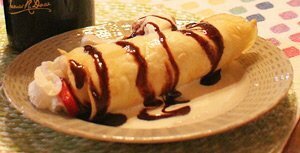 We also included whipped cream, with vanilla bean ice cream on the side and chocolate sauce drizzled over the rolled-up crepe. I’m pretty sure everyone liked the crepes; there were no leftovers. The rich, deep flavors of both Ports perfectly balanced the sweet and tart flavors of the fruit and crepes. Some of us liked the 20-year better while others liked the 10-year better. But we all agreed there was no wrong answer when it came to these Ports. Crepes look elegant and difficult to make, but they are simplicity itself. All it takes is a little practice. Don’t worry if the first couple don’t turn out great. As you figure out the right heat and how to swirl around the batter, you will be making perfect crepes in no time. Whisk together the flour and eggs. Gradually add in milk, water and vanilla, stirring to combine. Add the salt and butter, beat until smooth. Heat a lightly oiled small frying pan over medium high heat. Pour the batter into the pan, using 1/4 cup for each crepe. Tilt the pan with a circular motion so the batter coats the surface evenly. Try to keep the crepe thin. Cook the crepe for two minutes or less, until the bottom is light brown. Loosen with a spatula, turn and cook the other side for about a minute. You can cook these ahead of time and then warm them in a microwave before serving. Fill each one with your desired dessert filling.